Finding creative ways to come up with a great date idea can be occasionally stressful, but my approach has always been to keep is simple. Some of my favorite past dates are ones that were not planned; random adventures always end up with random results, and usually give you awesome story fodder for later. My biggest piece of advice would be to not let the little things that may go wrong throughout your date get to you; keep your focus on your date and on having fun. Ok, so you can make a twist with this one. If you don’t want to do the traditional movie and date night you can cook for each other at your home. One person can make the main course and the other can make the dessert. Then after the meal you can make a fun cuddle-fort in your living room or use your smart phone as a projector, grab a white sheet and hangout in your backyard for a movie under the stars. Take a look at attractions in town close by. Pick somewhere where the two of you can drive, about an hour away, and enjoy the day there. Look up some cool shopping areas, antique stores, nature parks—you never know what you will find. Grab a camera or two and put on your best pair of comfy shoes and start your daytrip adventure. You can either go to a familiar place that you love or go to a different part of town you have never been before and take a walk. You never know what you might find. I recently took some pictures in an alley that was filled with graffiti and the pictures turned out amazing! Just remember to bring a tripod and put your camera on a timer, or grab a selfie stick. Swing by a coffee shop after and sip drinks while you scroll through the pictures you took – I bet you this will be one fun and memorable date! Cheesy and romantic—I know—but this is a great way for you both to stop and smell the roses. These days, everything is always so hectic and everyone has a “need it now” mentality. It is a great way to just relax and enjoy some time together. Make sure to not plan anything else that day (unless it is a massage) and make it a goal to just relax. Oh, and no phones or electronic devices on this date. Keep the focus on each other, and that kickass potato salad you’ll make. Let us know some of your favorite date night ideas and we can feature them on our blog. Tweet us @gfmdating today! 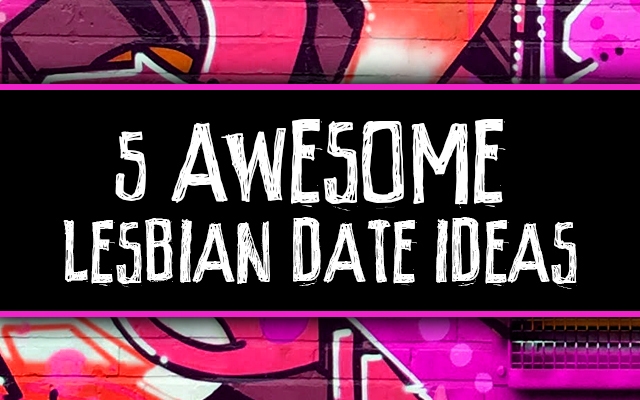 This entry was posted in Dating & Relationships, Fun Stuff and tagged date night, dating, Lesbian Date Ideas, lesbian dating, lgbt by Janey Grace. Bookmark the permalink.